Vail’s Lindsey Vonn won her third straight World Cup downhill Sunday, again edging Italian rival Sofia Goggia in Garmisch for the second consecutive day to record her women’s record 81st career victory. In winning her fourth World Cup race of the season — and the final downhill before the upcoming Pyeongchang Winter Olympics — Vonn is showing she’s all the way back from lingering injuries that have plagued the 33-year-old the last several seasons. Vonn is also demonstrating that she and Goggia will be the racers to beat in the speed events of women’s super-G at the Pyeongchang on Feb. 17 and downhill on Feb. 21. Having won the downhill gold at the Vancouver Winter Olympics in 2010, Vonn missed the 2014 Sochi Games due to a crash and injury at the 2013 World Championships. She has been battling for years to get back to the Olympic stage and now appears to be close to peak form. At last year’s Olympic test events, Vonn twice finished second to Goggia on the Pyeongchang track. This weekend, Vonn flipped that script, beating Goggia by just over a 10th of a second on Sunday with a time of 1 minute, 37.92 seconds. Goggia came in at 1:38.03, and Lichtenstein’s Tina Weirather was third by just a hundredth of a second with a time of 1:38.04. EagleVail’s Mikaela Shiffrin chose not to race in the speed events at Garmisch, instead opting to train and travel early to Pyeongchang, where she’ll be defending her gold medal in slalom and seeking a first medal in giant slalom earlier in the Games. The women’s GS is Feb. 12, followed by the slalom on Feb. 14. Shiffrin was on a hot streak similar to Vonn’s earlier this year, kicking off 2018 with five consecutive wins, but she’s winless in the last six races she entered. Still, Shiffrin leads the overall chase by a wide margin, having won 10 World Cup events so far this season as she looks to defend her overall title from last year. Vonn is now just five wins from tying Sweden’s Ingemar Stenmark for the most World Cup wins in the history of the sport. Both Vonn and Shiffrin are seeking to become the first American women in the history of alpine ski racing to win a second Olympic gold medal. Only Ted Ligety has accomplished the feat on the men’s side, and he’ll be seeking a third gold at Pyeongchang. Lindsey Vonn (Vail, Colo.) is ready for the 2018 Olympic Winter Games after picking up her 81st-career FIS Ski World Cup victory – her second-straight downhill win and third of the season – Sunday in Garmisch-Partenkirchen, Germany. It was another good news, bad news day for the U.S. women as Breezy Johnson (Victor, Idaho) picked up her second-straight top-10 result in 8th; Laurenne Ross (Bend, Ore.) was 23rd; Alice McKennis (Glenwood Springs, Colo.) 29th and Alice Merryweather (Hingham, Mass.) in 31st. Stacey Cook (Mammoth Mountain, Calif.) was having a solid run until she hit a compression midway down the Kandahar track and slammed into the A-net at a high rate of speed. However, she did stand up briefly before being taken off the course in a sled as a precaution and is OK. In Saturday’s race, Jackie Wiles (Portland, Ore.) suffered a left leg injury resulting from a crash. She will miss the upcoming Games and the rest of the season. Ross also crashed in Saturday’s race. 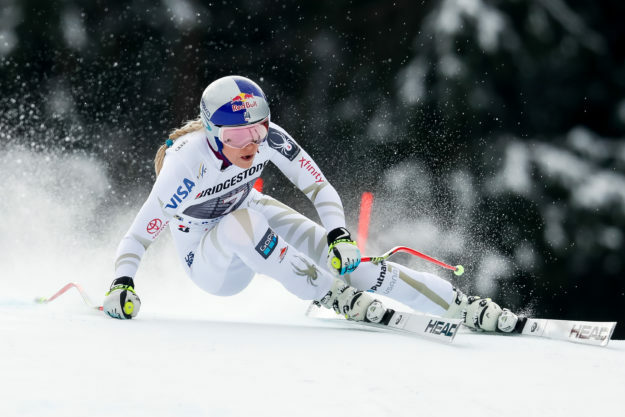 In Sunday’s full-length downhill race, Vonn absolutely nailed the top portion of the Kandahar track, leading at the first two intervals over Liechtenstein’s Tina Weirather. But she fell off the pace in the middle portion of the course, only to come storming back on the bottom to move into the lead. “Its kind of similar to Lake Louise where I know exactly what I have to do to win,” Vonn said of the Kandahar track. “The bottom section is always critical. Almost every race I’ve raced here, the race is won or lost in the last 30-45 seconds. For the second consecutive day, Italy’s Sofia Goggia finished second to Vonn. Weirather was third. Goggia continues to lead the overall World Cup downhill standings by 23 points over Vonn with one downhill remaining next month at the World Cup Finals in Are, Sweden. Mikaela Shiffrin (Eagle-Vail, Colo.) opted to sit out this weekend’s speed events to train and rest up for the Olympic Winter Games. Shiffrin continues to lead the overall World Cup standings by 671 points over Switzerland’s Wendy Holdener. Up next, the 2018 Olympic Winer Games. The first event for the women will be giant slalom on Feb. 12, followed by slalom Feb. 14; super-G Feb. 17; downhill Feb. 21; and alpine combined on Feb. 23.